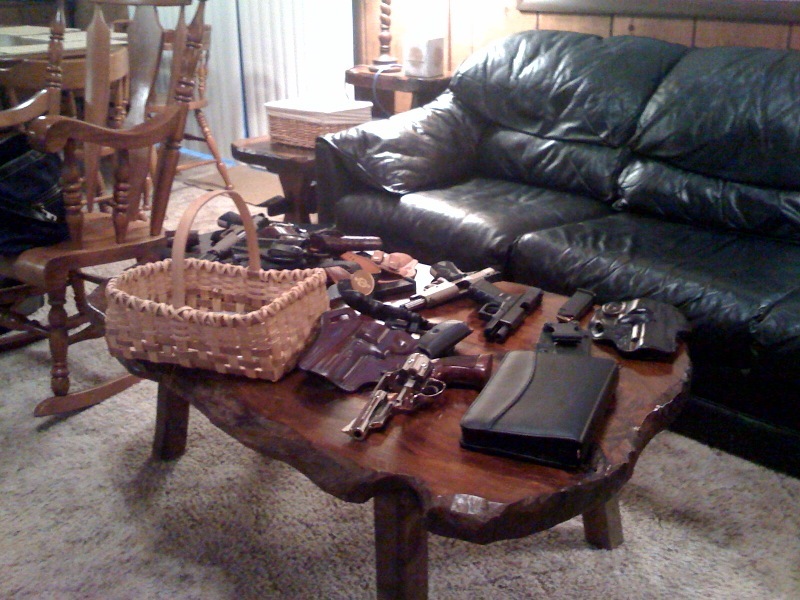 … perusing through a friend’s collection of Mitch Rosen holsters, I discovered Bitter is a closet holster sniffer. Hardly a holster went by that went unsniffed. I have to admit, quality gun leather does smell pretty good. My kydex holster smells more like dryer lint in comparison. The day planner on the table is actually not a day planner, but a carefully crafted holster that holds my Glock 19 and a spare magazine quite nicely. That could come in handy. If you ever alter a kydex holster by cutting or sanding it, the “dryer lint” smell will be upgraded to “rotting sulfur-charred flesh in the darkest pit of hell”. Of course, leather holsters worn daily in humid environs tend to become rather stinky as well. Would that be at the home of any of Joe Biden’s kin? Not sure which smells better, a saddlery or a tobacconist shop. (And I don’t smoke).